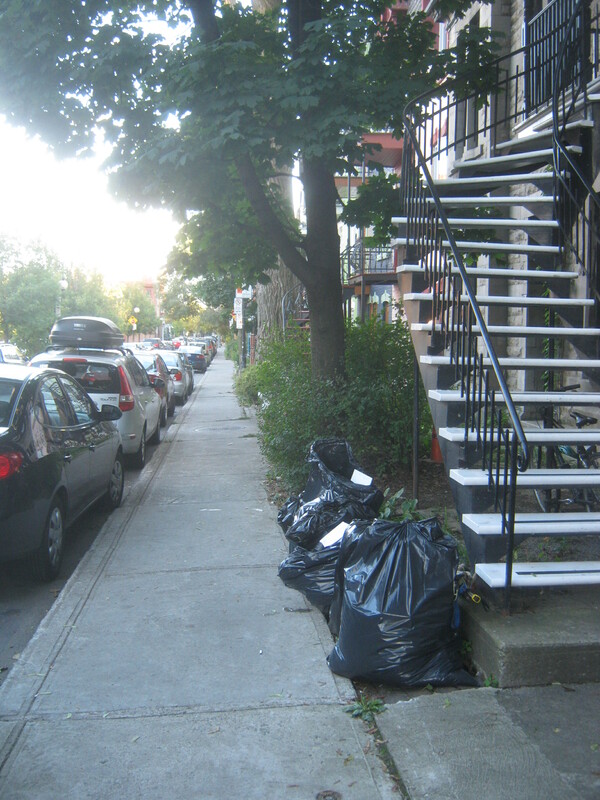 I got up early and went out to Villeray and Park Ex. I came across this pile in front of a commercial space by Highway 40 on des Belges. 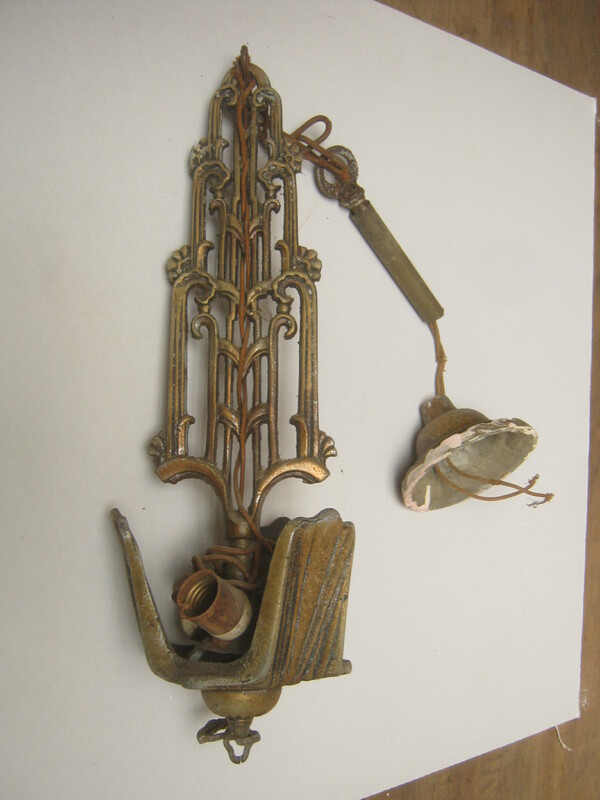 Most of what I found was junk, but I did pull out a nice old ceiling lamp. The wiring needs work, but I think this would clean up pretty nice. Might it be from the Art Deco era? While out in Park Ex I came across an abandoned house which is slated to be demolished. The back door was unlocked so I looked around and took some photos. If interested check them out here! It, surprisingly, looks mostly untouched by intruders – most abandoned buildings in cities (especially unlocked ones) are heavily tagged and graffitied. 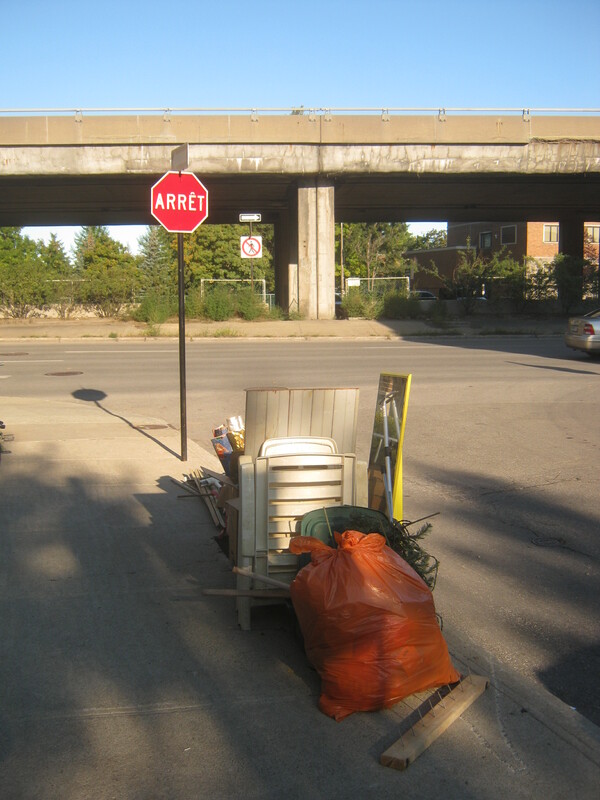 Most interesting though was this pile near St Denis and Mont-Royal. In this case I know for sure that the original owner passed away. I googled a name I found amongst the trash and discovered some online eulogies. I won’t reveal the name in respect of the privacy of the family but from the sounds of it he was a pretty good person. 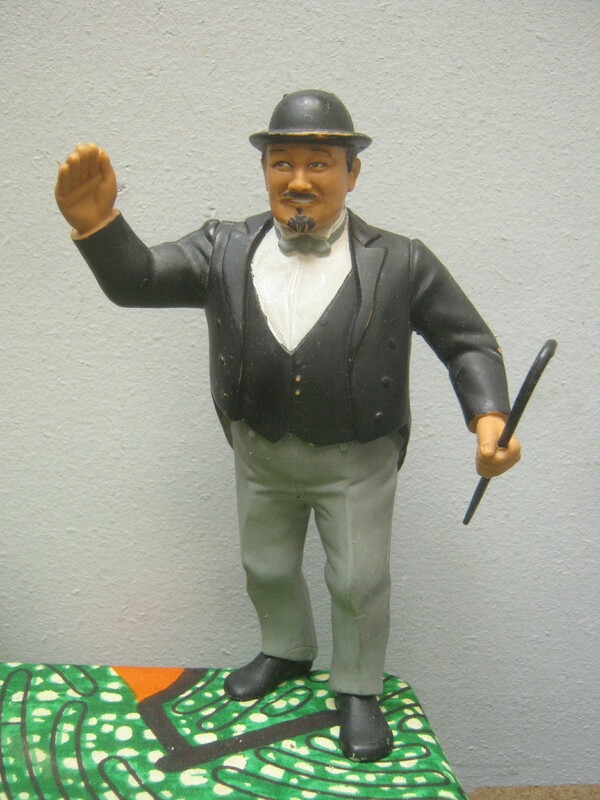 This is a 1986 “Mr Fuji” WWF wrestling toy. I never really watched wrestling as a kid but I appreciate this toy. I may keep it as a decoration for my room, if not I’ll put it in a yard sale. 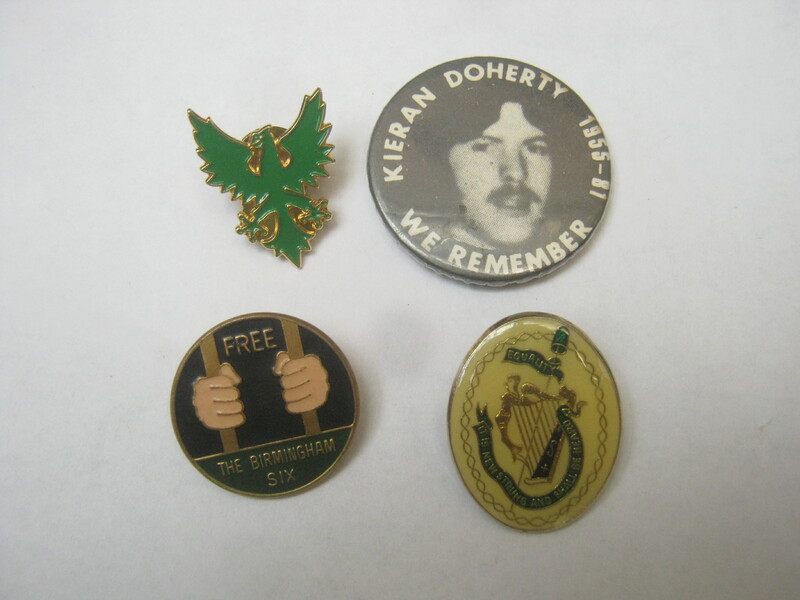 A few buttons, some of which (if not all) relate to Irish republicanism. Kieran Doherty was one of the hunger strikers that died in prison after having not eaten for 73 days. The Birmingham Six were men convicted of bombing a pub in England and later released on appeal due to a lack of real evidence. Finding these things makes me want to do some reading on the history of the conflict in Ireland. I have some Irish roots so there is some personal significance as well. Inside the bags was a good amount of jewelry. Much of it is costume jewelry but there’s also a good amount of silver. All of it is quite beautiful. 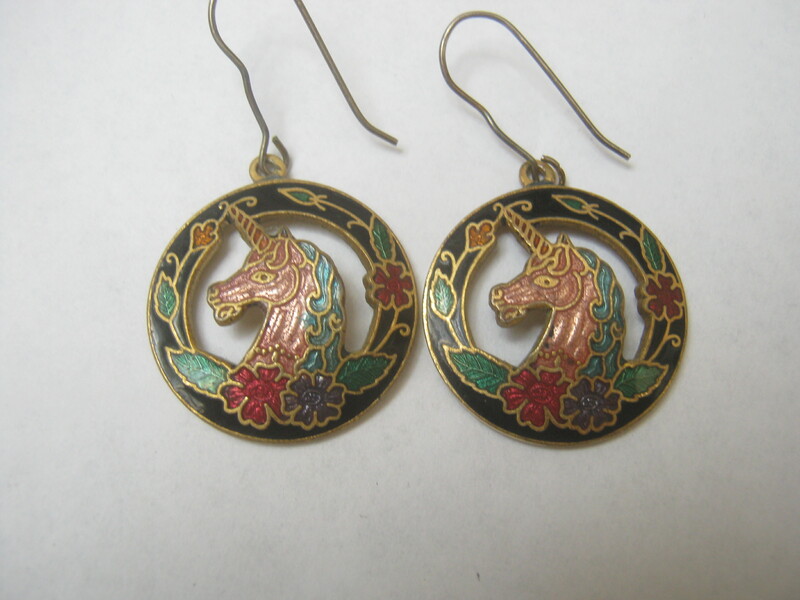 Above is a nice pair of enameled unicorn earrings, below are a pair of cool silver earrings. 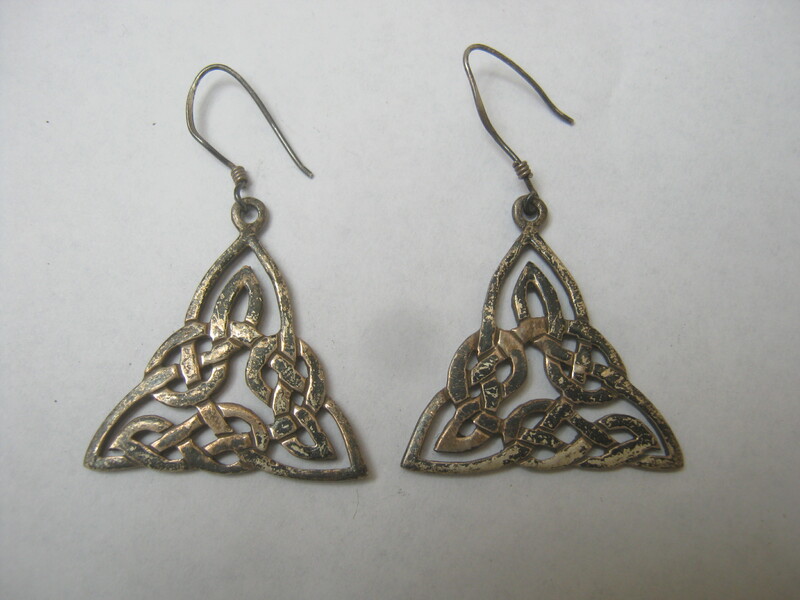 They’re pretty tarnished but they should clean up nicely. I’ll show you more of the jewelry in a future post. Apparently the man’s wife passed away several years ago, I assume these would have belonged to her. 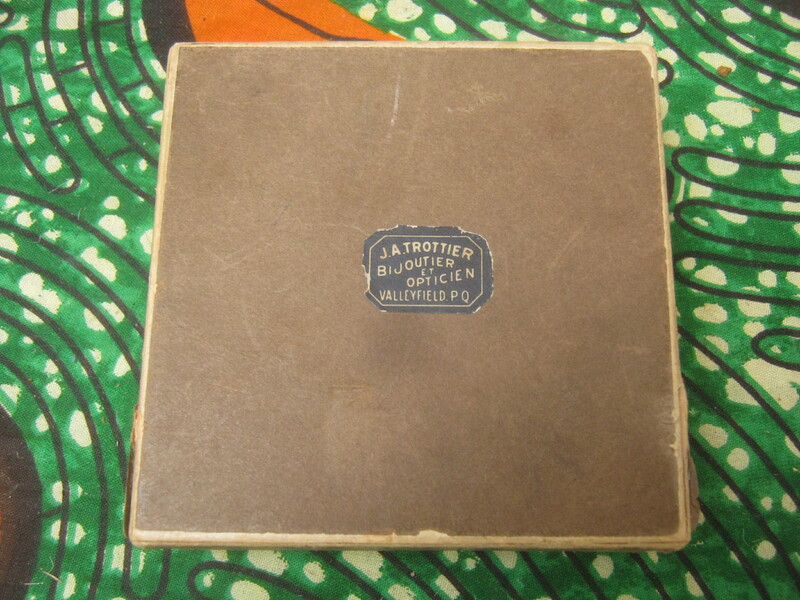 Last, for now, is this little cardboard box containing a couple hollow plastic dolls. 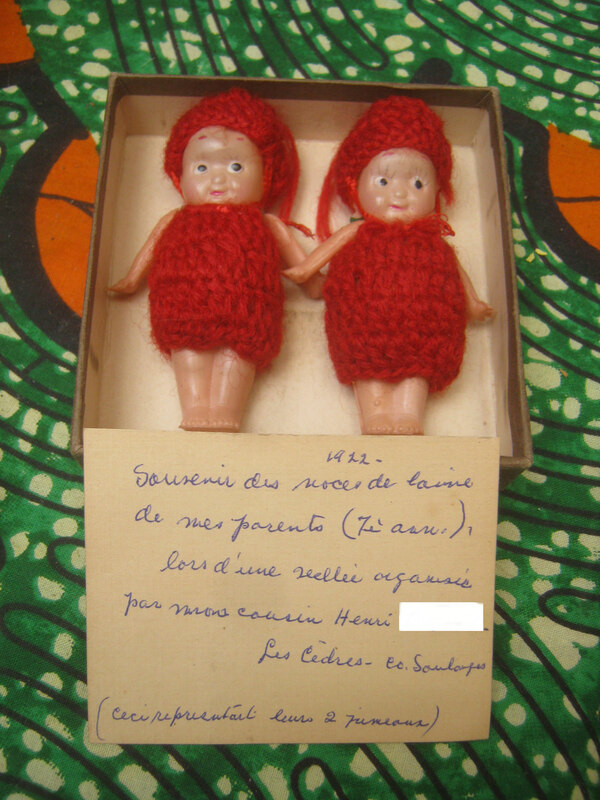 They were apparently a souvenir from a wedding back in the day, but there are a couple of words I can’t make out (partly because of the handwriting and partly because of the French). If anyone can translate the message let us know what it says! The “Les Cedres” (The Cedars) part is a town South of Montreal, that I know. I’ll show you some more pictures of the jewelry in the coming days. I’m going to head to the Plateau this evening and also plan on exploring the mostly-novel Town of Mount Royal tomorrow morning. etc etc. All in all, good stuff. some nice finds this time. I am delighted by your finds but I am shocked that some valuable souvenirs of a dead man were thrown out in the garbage.These souvenirs could have been kept by family members or friends.Thanks to you for recovering this!Many happy returns of the day. I love following your posts. Keep it up! I just wanted to translate the card with the 2 dolls for you. It says: Souvenir from my parents wedding “wool anniversary” (7th year) given at a party organized by my cousins Henry and ? Ah, I thought that said laine (wool) but never heard of it meaning the 7th anniversary before… thanks for the info! the comment in french roughly means : 1922 – Souvenir from my parent’s wool wedding (7 years) from an evening organized by my cousin Henri. Les Cèdres (the other part I cannot read either) in the parenthesis : This represented their twin sons. oops, i wasn’t quick enough! I remember when we cleared out my mom’s house – she had done a good job over the years of getting rid of stuff, but it was sad that a chest full of her keepsakes – things that were important to her – went to the trash or goodwll. On the Irish front – for a quick lesson in Irish history the movie ‘The wind that shakes the barley’ is good, but painful to watch. we got to watch it in Ireland with our relatives. I am ashamed to say that while I knew of the fight to gain independence from the British I didn’t know that a civil war -albeit a very short one- followed the independence. Short, btu incredibly sad. My great uncle was in the IRA back during the fight for independence. Lots of cool stuff! Looks like you have a hew nice things to add to your Etsy store. That lamp is certainly Art Deco in style. Those might be celluloid kewpie dolls. I think they’re celluloid dolls too – quite in demand these days. Great find on the lamp too! Thanks again for sharing your find. I admire the respect you showed to these people. That house is cool!! The “Rehab Addict’ would have loved it!! I bet she was a beauty in her day!! !